Practical, Easy to use Bins. In the past, farmers have had problems finding satisfactory methods to store their waste plastic. The DOMUS bin is the this problem. It's easy to store your used bale and silage cover with the Domus Bin. 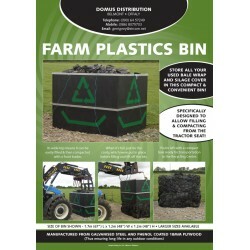 Designed to allow easy filling and compacting from the seat of your Tractor. This product is worth 1707 loyalty points. We offer a 100% refund gaurantee. Includes free delivery to anywhere in Ireland. Click here to see the how it works video. The bin is manufactured from galvanised steel and phenol coated 18mm plywood. It's wide top allows it to be filled and then compacted with a front loader. Then when it's full, simply tie the chords and lift the bin. You're left with a compact bale ready for transport.